In the 1990s, the previous century of African film culture was revolutionised by the emergence to continent-wide popularity of Nigerian cinema often referred to as Nollywood. These films have existed now for two decades but the nature of the industry and its place in society is constantly in flux, subject to constant technical, institutional and aesthetic change. Their immense success has generated a sustained backlash. Longstanding critiques that the films are thematically vulgar and technically embarrassing have generated the emergence of a ‘new Nollywood’ designed to create a more gentrified cinema. For others, dissatisfaction with Nollywood has driven a turn toward vernacular films which are seen as more ‘culturally’ or ’religiously’ appropriate. The result is that these films, and their place in Nigerian society, is changing. This workshop brings together emergent scholarship on Nigerian cinema by those most familiar with the radical changes that the film industry is undergoing. It breaks apart the monolith of Nollywood by also focusing attention on Yoruba and Hausa cinema as well as the interrelations between all three. What is singular about Nigerian films is that they have developed aesthetic forms, genres, and technical infrastructures that are highly distinctive especially when compared to other mainstream popular cinemas from Hollywood, to Egyptian, to Hindi film. The conference will chart these similarities and distinctions and the new directions in which the film industry is heading. 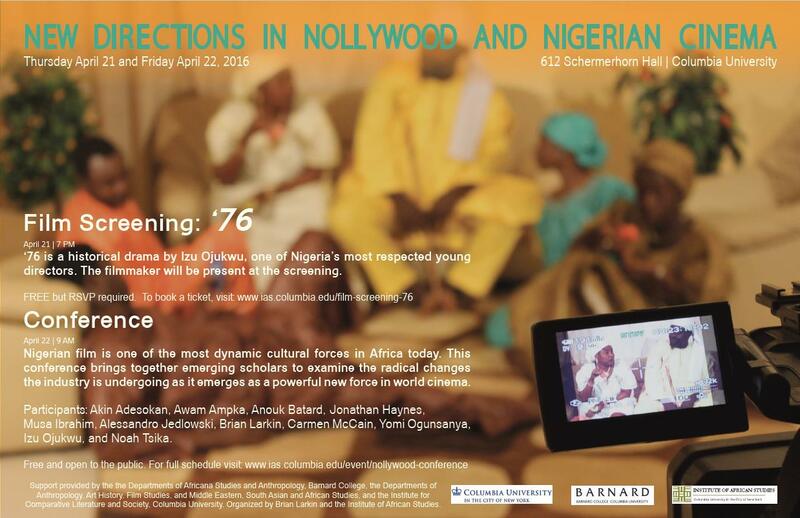 Based around the work of emerging scholars it also discusses the new directions in which the scholarship on Nollywood is being taken by a new generation of scholars. Friday's conference will be prededed by a sneak preview screening of the new film, "76," with director Izu Ojukwu in person, on Thursday, April 21. The screening is free, but RSVP will be required. Visit the film screening event page for more information. Conference organized by Brian Larkin and the Institute of African Studies. Support from Departments of Africana Studies and Anthropology Barnard College, the Departments of Anthropology, Art History, and Middle East, South Asian and African Studies, and the Institute for Comparative Literature and Society, Columbia University.